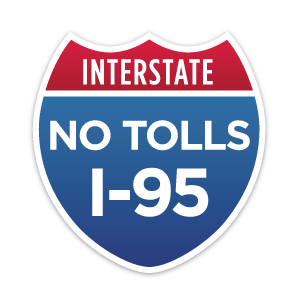 Sign the petition against tolls on I-95 and show North Carolina legislators that residents from throughout North Carolina are opposed to tolls on I-95. Once you have signed it, make sure that you share it with your friends by sending them to the website as well. If you are a business or local government and would like to join our growing Coalition in opposition to tolls on I-95. Details on the coalition can be found here and If you have questions please call the Roanoke Valley Chamber of Commerce at 252-537-3513 or email notollsi95@gmail.com. The North Carolina General Assembly is in session and legislators need to hear about the impact that tolling I-95 will have on communities, business and you. Governor McCrory made his opposition to tolls clear on the campaign trail, and now we need to him to keep his promise by withdrawing North Carolina's application to the Federal Highway Administration. To email the Governor, click here and call him at (919) 733-5811. Tell him to withdraw North Carolina's application to toll I-95 today! Our success in defeating tolls on I-95 will require us to work together. Tell your friends, family and neighbors to join the campaign to fight against tolls on I-95. The more people that we have working together, the greater our chances of defeating tolls. Writing a letter to your local newspaper is a great way to let people know about your opposition to tolls on I-95. The information found on our website under “Position” can help you with information to write your letter. The newspaper’s website will generally have the information needed to send your letter.